I have had to postpone starting the faction AI as I have been making some major changes to the way resources and items are managed. 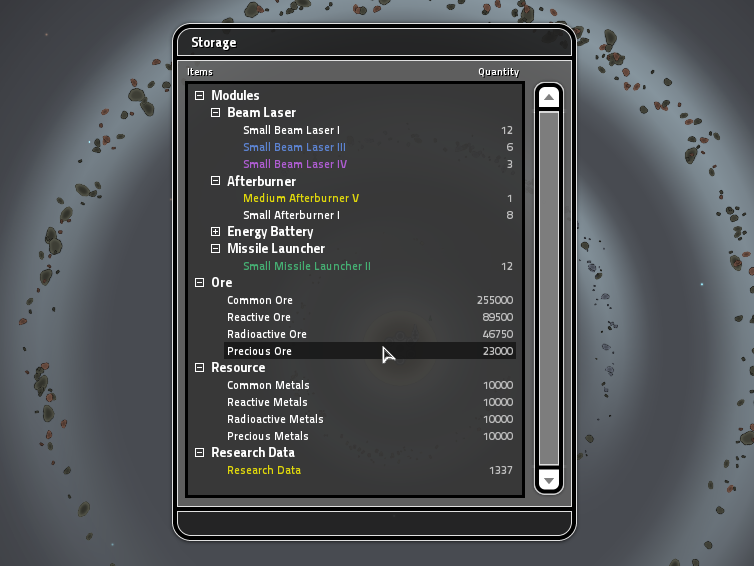 When resources are collected such as when some asteroid ore gets processed at a refinery and refined into metal, it will no longer just vanish and get added to the resources total counter at the top of the screen. Instead the metal gets added to the colony inventory and will remain there until its used or moved to another location. 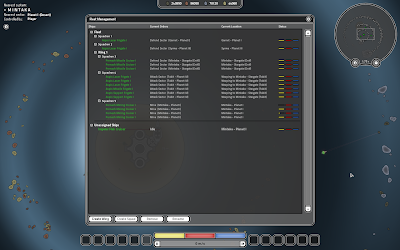 If you have seperate colonies for ore refining, equipment and ship production then you will need to transport the items they require between each of them rather than having your entire empires resources available invisibly no matter where they are being used. All ships have at least a small cargo hold but I will also add new transport ships that can carry large volumes of cargo but will be quite fragile and defenseless. This is how the transport orders screen currently looks. 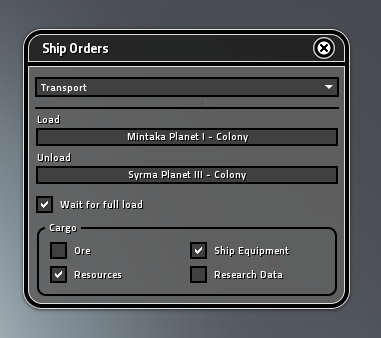 I would like to keep it as simple as possible, so I am not adding multiple waypoint settings and items will be seperated into different cargo catagories. If you really need to transport cargo both ways between planets you will need an extra transport ship with different orders although there shouldnt really be a need for this. Something I am also experimenting with is requiring the "data" produced by research facilities on colonies to be transported back to your designated capital before the points can be spent on research projects. Most of these changes are to discourage having well defended colonies that are isolated away from your main empire but still be fully functional. Hopefully this should all make empire building a lot more complex and enjoyable and open up a lot of possibilities for features I would like to add in the future. EDIT: This is all still subject to change as it may turn out to be no fun or requires too much micro-management. Some of the things I have been working on recently. I have started on the fleet management screen that shows all your ships including their current orders, location and status as well as the squadron and wing they belong to. Ships can be dragged around to move them into different squadrons and the squadrons can also be moved into wings which will group them together. Wings dont currently have any purpose other than to make it quicker and easier to assign orders for a large number of ships. Squadrons can contain up to 9 ships that will move in formation and work together as a team. Theres no limit to the number of squadrons that each wing can have. You can right click on any of the ships, squadron and wings in the tree view to bring up a context menu that will show a list of available settings and options for them. Some ships can now make strafing runs when attacking their target instead of just orbiting or chasing them. This will probably be used only for small fast ships such as fighters as it decreases the effectiveness of its weapons as they occassionally go out of range from their target when turning around to start another run. 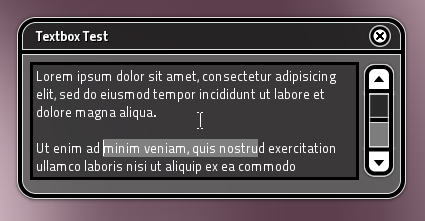 Finished coding multi-line scrolling text box widget's which are used for user input text when renaming things like ships/squadrons/colonies and save game naming. This was quite troublesome and time consuming to code so thought it was worth a mentioning these. 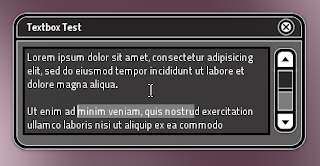 Coding a 'fully-featured' text box from scratch is not fun! Next I need to fix lots of bugs for the things I have recently added, then soon I will make a start on the high level faction AI (empire building stuff) for computer opponents as they dont currently do anything.